Pedro S. Gonzalez, 98, of Hamburg, died Sunday, February 10, 2019. Mr. Gonzalez was a native of Las Canous Michoacan Mexico and a resident of Hamburg for the past 19 years. He was a farm laborer and a member of the Hamburg First United Pentecostal Church. 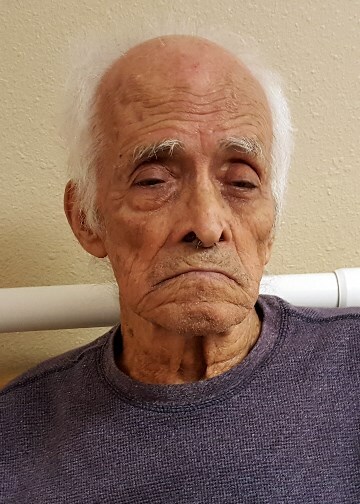 He is preceded in death by his wife of 64 years, Josefina Barajas Gonzalez in 2013; two sons, Antonio and Cecilio Gonzalez; a daughter, Rosa Gonzalez; three grandchildren, Teresa Gonzalez, Miguel Mondragon, and Rafael Corcoles; his parents, Delfino and Fermina Trujillo Gonzalez. He is survived by his children, Ysaac Gonzales, and wife, Maria, of Hamburg, Alicia Mondragon and husband, Fidel, all of Hamburg and Rosa Corcoles and husband, Juan, of Dumas; 14 grandchildren and 31 great-grandchildren. Funeral services are 2 p.m., Friday, February 15, 2019, at the Holy Spirit Catholic Church with Father Stephen Hart as celebrant. Burial will be in the Hamburg Cemetery. Pallbearers are Pedro Gonzalez, Gerardo Gonzalez, Guibrann Gonzalez, Miguel Mondragon, Cecilio Mondragon, Juan Corcoles and Valdemar Martinez. Visitation will be 6-8 p.m., Thursday in the funeral home chapel.